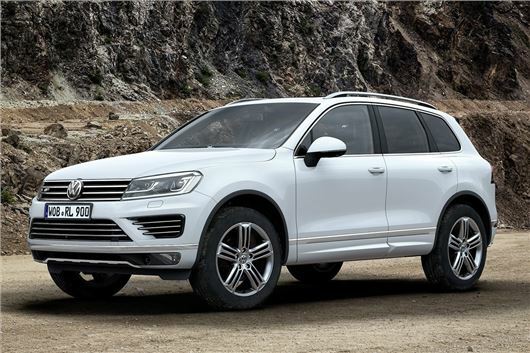 Volkswagen has announced details and pricing for the revised Touareg. The range kicks off with a the 3.0-litre 204PS TDI in SE trim, priced from £43,000, rising to £47,500 for the range-topping 262PS 3.0-litre TDI in R-Line trim. Orders are open from 27 August and first deliveries are due in November. The engine range is simple, with a 3.0-litre V6 TDI available in two power outputs – 204PS and 262PS, the latter of which has had a power hike of 17PS over the outgoing car. Thanks to new emissions technology including the introduction of AdBlue additives and low-rolling resistance tyres, emissions are down and the Touareg complies with Euro 6 regulations. The 204PS engine now emists 204g/km, down 11g/km. All models come with an eight-speed automatic transmission and four-wheel drive as standard. Three trim levels are available, starting with SE. Standard equipment an eight-inch touchscreen with navigation, DAB radio, Bluetooth, 19-inch alloy wheels, dual-zone climate control, leather upholstery, bi-xenon lights, parking sensors and roof rails. The mid-spec Escape model is only available with the 262PS engine and has a greater off-road emphasis. It uses an advanced all-wheel drive system with a 50:50 torque split, mechanical locking differentials, higher suspension, 18-inch alloy wheels, a larger fuel tank and underbody protection. The range is topped by the R Line, which gets R Line exterior styling, larger 20-inch alloy wheels, lowered suspension, LED running lights, a panoramic glass roof, R-line seats, a heated steering wheel, electronically operated tail gate and keyless entry/start. Totally understated and very, very underestimated.